What are the Seven Great Demon Lords? The Seven Great Demon Lords (七大魔王, Nana Dai Maō?) are a group of Demon Lord Digimon who each represent one of the seven deadly sins. They are based on various demons from within Judeo-Christian mythology, a reference to Peter Binsfeld's classification of demons, most notably Paradise Lost by John Milton and Clavicula Solomonis Regis, an anonymous 17th-century grimoire. There are also two "Super Demon Lords" who are closely related to the group. Some of the species that are members of the Seven Great Demon Lords have also appeared as characters in other media, but are not members of the group. Both of the Super Demon Lords (超魔王, Chou Maou?) wear the Crowns of the Seven Deadly Sins, are derived from the Beasts of Revelation, and digivolve from the Seven Great Demon Lords. Each of the Seven Great Demon Lords possesses a unique "Crest" (紋章, Monshou?) displayed in one of the seven colors of the visible spectrum. Each depicts a sigil of one of the "Seven Olympian Spirits", a group of mythological entities who, under God, ruled over the 196 provinces of Heaven and presided over the natural world for 490 years each. Each Olympian Spirit is associated with a heavenly body, also depicted on the Crest. Within the space between the two concentric circles is text stating a designated Level (this is "666" for all the crests, a reference to the "Number of the Beast" mentioned in the Book of Revelation), System (the demon that traditionally represents the Great Demon Lord's respective sin), and Code (the Great Demon Lord's respective sin). At the bottom of the inner circle is text which specifies a caution for a Purgatory Level ranging between 1 and 7, corresponding to the arrangement of Purgatory within Dante Alighieri's La Divina Commedia. The Crown of the Seven Deadly Sins (７つの大罪の冠, Nanatsu no Daizai no Kanmuri?) is composed of all seven Crests arranged in an array and is worn by both Super Demon Lords, Lucemon Shadowlord Mode and Ogudomon. "LUCEMON FM" and "DAEMON" are used for Lucemon and Creepymon, respectively. The Gate of Deadly Sins (大罪の門, Daizai no Mon?) is engraved with seals depicting the Crests of the Seven Deadly Sins. The Towers of the Seven Deadly Sins (七大罪の塔, Nanadaizai no Tou?) are mysterious buildings that appear in Digimon Collectors. Once they begin appearing across the Digital World, they attract Digimon exhibiting their respective sin, as well as the Protagonist, who is sent to investigate them by the Royal Knights. Although the protagonist defeats the Great Demon Lords lurking within each tower, this only serves to bring about the manifestation of Ogudomon's tower, as well as the Super Demon Lord itself. In Digimon World: Next Order, the Seven Deadly Digimon create a tower each through boredom after having agreed not to fight each other, however the seven towers get destroyed by the Malevolent Fist. Though this group does not make an appearance in Digimon Frontier proper, the card based off of Lucemon Chaos Mode, Bo-137t, is a member of the Seven Great Demon Lords. The Seven Great Demon Lords as they appear in a flashback of Digimon Data Squad. From left to right: Daemon, Lilithmon, Barbamon, Beelzemon, Leviamon and Lucemon. Long ago, the Great Demon Lords almost brought ruin to the Digital World. However, they were stopped and reverted to Digi-Egg form, then sealed away to be forgotten. Some time before Marcus's induction into DATS, Akihiro Kurata discovered a temple which hid the sealed Digi-Egg of the Demon Lord of Sloth, Belphemon. He retrieved the egg and it eventually hatched into Belphemon Sleep Mode, after which Kurata began a campaign to awaken the Great Demon Lord by collecting "Digimon life energy", which would allow him to conquer both the human and digital worlds. Using his army of Gizumon to permanently murder many different Digimon, Kurata eventually collects the required energy after slaying the massive ElDradimon. Believing he has successfully brought Thomas H. Norstein to his cause, Kurata uses the "Digimon control device" Thomas had made for him to command Belphemon. However, during Belphemon's attack, Thomas double-crosses Kurata and destroys the control device, forcing Kurata to reassert control by transforming himself into data and merging with Belphemon, which causes it to transform into its Rage Mode. Soon after, Thomas comes to join the fight, with Marcus Damon on his way as well. MirageGaogamon faces off against Belphemon only to be stomped on. He might have been finished if Rosemon hadn't seized Belphemon's arm. Belphemon Rage Mode blocks the attacks shot by Rosemon and defeats Crowmon, who reverts back to Falcomon. Through Keenan Crier's rage, Falcomon double warp digivolves to Ravemon and attacks Belphemon but is unable to do anything more than anger him. Belphemon launches an attack at Marcus and Thomas, which Ravemon blocks. Due to his increasing anger, Kurata loses control to Belphemon's true conciousness as he is in "Rage Mode". Unlike Kurata, Belphemon's only goal is destruction. Marcus's Digi-Egg hatches and digivolves from Koromon to Agumon. Once Agumon digivolves into ShineGreymon, Kurata's face emerges from Belphemon's chest. He then drains electricity from the city to cause Belphemon Rage Mode to grow and swallow a number of space oscillation devices to give it the power to tear rifts between both worlds, threatening to bring both worlds crashing together. He defeats RookChessmon and BishopChessmon, who revert back to the two PawnChessmon. ShineGreymon digivolves into Burst Mode and destroys Belphemon Rage Mode, with help from Marcus' D.N.A. going straight through Belphemon Rage Mode's chest, where Kurata's face is. The "Mao Digimon" are created when one of the Code Keys of the Seven Deadly Sins is merged with a person who exhibited the respective sin. However, they can be destroyed with enough hard work before they can fully regain their strength. During a series of Digimon attacks, earthquakes, and disappearances, the Mao Digimon reveal themselves with an attack from Creepymon. Five of them, Belphemon, Barbamon, Lilithmon, Beelzemon, and Leviamon, are quickly defeated, releasing their respective Code Keys and the children they were each made from. Lilithmon is revealed to be created from Yuma Kagura, the little sister of one of DATS's researchers, Tsukasa Kagura. Meanwhile, a private investigator named Kosaburo Katsura and his Digimon Biyomon attempt to steal the Code Keys. After Leviamon is defeated, Kagura appears and reveals that he is behind both Kosaburo and the Mao Digimon, as he wants to release Lucemon in order to become the strongest Tamer. He had his henchmen DemiDevimon kidnap the children and transform them into the Mao Digimon, while Creepymon would take the Code Keys of the defeated Mao Digimon to apply to Lucemon's seal. After a defeat in the Doomsday Forest, Creepymon attack DATS Headquarters but is defeated again. A young girl named Manami Nitta runs to the dying Creepymon, who reverts to his human form and is revealed to be her father, a lost DATS member named Masaki Nitta. Kagura had told Creepymon that the only way to return home to the Real World was to retrieve the Code Keys and release the seal on Lucemon. Masaki reveals that Kagura already has the Code Key of Wrath, but as Thomas realizes that Creepymon's attack was merely a distraction to give Kagura time to release the seal, Masaki begins to dissipate, as he had spent too much time as Creepymon and was no longer anything more than mere data. Kagura finally releases Lucemon, who fights DATS but is defeated. However, its defeat proves to be only temporary, as Lucemon quickly revives himself and transforms Kagura into the Code Key of Pride, then absorbs him. While the first six Code Keys removed the seal on Lucemon, and the Digisoul charge awakened him, the Code Key of Pride allows him to leave the Dark Area entirely. Although Lucemon is defeated once again, he transforms into the terrifying "Cho-Mao". Despite this form's overwhelming power, DATS manages to defeat him as well, freeing an ashamed and repentant Kagura and ending the Mao Digimon crisis. However, the cards still exist and the data of the Mao digimon has not yet been deleted. After each Mao Digimon is defeated, a new incarnation of its trait appears at the location of its demise. The DATS team tracks each new incarnation down, and the Mao bestow their power onto the member of the team that best exemplifies their trait, generally after a fight. This allows the team member's Digimon to take the Mao Digimon's form through Digivolution. Agumon gains Belphemon's and Creepymon's, Lalamon gains Lucemon's, Gaomon gains Barbamon's, Falcomon obtains Leviamon's power, Biyomon gains Beelzemon's, and Renamon gains Lilithmon's. As the Cho-Mao (超魔王, Chō Maō?, lit. "Super Demon Lord"), leader of all the other Mao Digimon, it takes all six of the other Code Keys to release Lucemon from his seal in the Ice Caverns. He used his dark powers to manipulate Tsukasa Kagura's bitterness towards Thomas to have him begin a quest to retrieve the Code Keys from his fellow Mao Digimon's data to free him from imprisonment, all the while making him think he was in charge of the evil Digimon working for him. Upon being unsealed and given a DigiSoul Charge from Kagura, Lucemon proceeded to fight the DATS team, but lost. Seeing that he needed to gain more power from the Dark Area, Lucemon betrays Kagura by turning him into the Code Key of Pride and absorbing him to gain freedom from the Digital World. Confronting the DATS team again, Lucemon digivolves to the Demon Lord form, the final boss, only to be defeated once more. Paradise Lost : Causes a powerful explosion of red energy. Dead or Alive : Deals damage based on a clock's roullete result. Terrible Dance: Performs a spin kick. Dimension Slasher: Slashes the enemy and turns the Digimon into Digi-Eggs. Purgetorial Flame: Summons the seven crests of the Mao digimon, sending out a powerful blast of fire. Leviamon is the boss of the Sea Precipice Jerapilus and is formed from an envious child and the Code Key of Envy. Upon his defeat, he wondered how the hearts of the DATS operatives could be so pure. Creepymon first appears and defeats Marcus Damon and Agumon at Walter Island, after the pair defeat Tylomon. While overlooking the sealed Lucemon, it meets Tsukasa Kagura, who promises to give it a portal to the Real World. It later encounters the DATS team in Doomsday Forest Ruins, where they beat it. However, Kagura keeps his end of the bargain and by using five of the Code Keys, breaks down the barrier between the two worlds enough for it and other dangerous Digimon to leave. In the real world, it tries making contact with former DATS member Misaki Nitta's daughter, who sees that he is within the evil Digimon. However, a final battle between Creepymon and the DATS team frees Nitta from him, but at a heavy cost. Not only did he give the "Code Key of Wrath" to Kagura, he is not able to return to normal because he was Creepymon for an extended point of time, remaining as data fragments in the Digital World. Flame Inferno : A powerful blast of fire. Chaos Flare : A more powerful blast of fire. Double Dust: Slams fists over target's head. Belphemon is the boss of the Rage Caverns and was created from a missing boy and a "Code Key of Sloth" card. After the DATS team defeat him, the boy and card return to normal. Belphemon was responsible for seismic activity that the DATS team felt during their search for him. Gift of Darkness : Summons a damaging storm of darkness. Dark Horn: Charges head-first into a target. Barbamon is the boss of the Mirage Museum and was created from a missing girl and a "Code Key of Greed" card. After the DATS team defeat him, the girl and card return to normal. Pandemonium Lost A swipe of Barbamon's staff. Death Lure : Instant death spell used on single target. Hell's Flame : Blast of fire from Barbamon's staff. Beelzemon is the boss of the Digital Dungeon. He is made from the Code Key of Gluttony and a gluttonous child. Upon his defeat, he admits the DATS team is "cool". Darkness Claw : Single claw swip. Heart Break Shot A powerful, single gunshot. Lilithmon is the boss of Livilus Island. Lilithmon is created from Yuma Kagura and the "Code Key of Lust" card. Befitting the sin that created her, Lillithmon seeks to flirt with men. She insults and then fights Yoshino, but after the DATS team defeats her, Yuma and the card return to normal. Darkness Love: Uses a lustful aura to disrupt the opponent's mind. Phantom Pain: Curses the opponent with a dark breath. Razor Nails (Nazar Nail): Rots the opponent by attacking with demon claws. Evil Sigh: Blows an evil sigh upon the opponent. After getting the final quest, the Seven Great Demon Lords send the protagonist a message to challenge the Tamer King to a fight before they destroy the Digital World. The protagonist is challenged to battle by each of the seven in turn, with each victory unlocking a new area. Afterwards, they challenge the protagonist to fight all seven of them one after the other in a series of battles to the death. 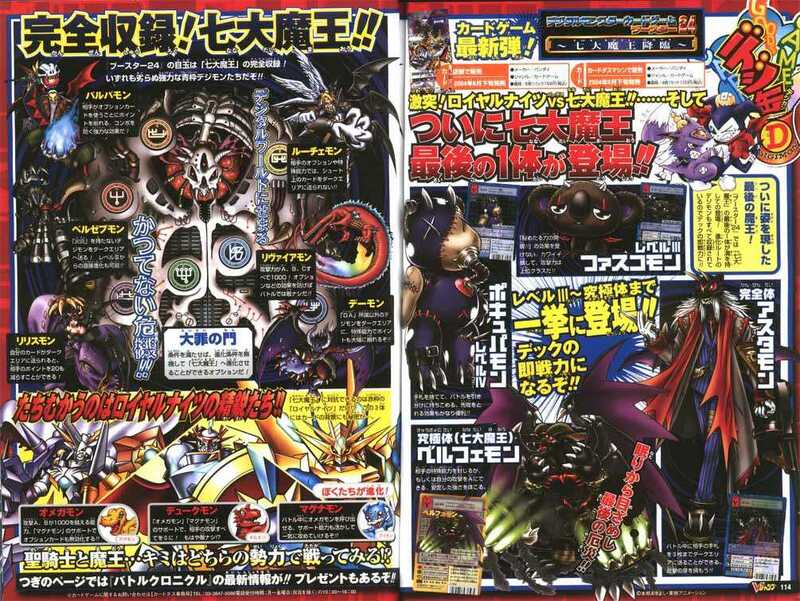 After Belphemon Rage Mode is defeated[please confirm], Beelzemon reappears, having managed to reform its evil ways, and grants its power to the protagonist in the form of scan data. Lucemon Chaos Mode first appears at Core Field at level 75, then at Destroyed Belt. Leviamon is fought in the Demon Lord quest at the Undersea Drive and again at Destroyed Belt. Daemon must be defeated by the player as part of the quest to defeat the Seven Great Demon Lords and is the first Great Demon Lord that the player fights. The fight happens at the Hard Mountains and then at Destroyed Belt. Belphemon is one of the final bosses in Digimon World DS. After defeating the first Great Demon Lord, Belphemon challenges the player by luring him/her into the final domain, where he and the other Great Demon Lords ambush the player. When the first six fall in battle, Belphemon will personally fight the player. He appears as the strongest Great Demon Lord and the strongest unobtainable boss or even the strongest Digimon in the game. Barbamon appears first at Lava River, then at Destroyed Belt. Beelzemon appears first at Sky Palace and then at Destroyed Belt. He is the second Great Demon Lord that the player fights. He is also the only obtainable Digimon that is a member of the Great Demon Lords, obtaining a 100% data scan of him and Calumon's after completing Quest 60. Then, any Infermon can digivolve into Beelzemon. Lilithmon appears first at Tropical Isles at Level 75, then at Destroyed Belt at Level 99. Barbamon is the Demon Lord who has taken over the Host Computer Yggdrasill in the System World, where he now makes his base. He aims to take over the Digital World by obtaining all the DigiMemories for the future of Digimon, NEO, already having the Dark DigiMemory. For that purpose, he creates the Commandments and recruits Shou Kahara and Peckmon, who have the Bird DigiMemory. As a member of the Seven Great Demon Lords, he forces himself into System World and confronts Yggdrasill on the policies of "Art" Digimon, Digimon born with Tamers. Upon deciding that revolution is in order, Barbamon merges with Yggdrasill and became the host computer itself. He fights Tsurugi Tatsuno but is killed when VictoryGreymon destroys him. His last act is to give his gathered DigiMemories to NEO, giving him consciousness. Barbamon appears one last time when the other DigiMemory holders restrain NEO; his Dark DigiMemory imprinted with his consciousness gives NEO the ability to attack Tsurugi and Yuu Inui, only to have his own Commandments turn on him. Laylamon is aware of Barbamon's true plot, but she is not interested in it as she has her own plans to rule over the Digital World. Consequently, she is put as a decoy by him in the 60F of the DigiTower. The Seven Deadly Digimon are Digimon who stand above all demons. They are crowned the Highest of the High and have evil within them at their creation. They exist in all parallel worlds simultaneously, which is also a defense mechanism. They are a natural, primal factor of the world. In another universe, the Digimon Tamer Sayo of the Night Claw organization killed the Seven of her world and thus increased the power of the Seven Deadly Digimon in every other. In punishment, she lost her partner Dianamon. To regain her partner, she must kill the Seven of Aiba's world. Without her partner, however, she lacks the strength, so Mirei Mikagura contracts Aiba to kill the Seven and explains the backstory to them. Aiba accepts, and though Sayo disagrees with having someone else fight for her, she decides to trust them. Mirei alerts Aiba to the location of each of the Seven, and they kill each of them in turn, obtaining one of the Evidence of Sin each time as their spoils. Each one is inherent to one of the Seven and is also proof of Dianamon's punishment, so gathering them all will free her. After killing all of the Seven, Aiba hands over the Evidences of Sin to Mirei, who laughs and is excited at the prospect of allowing new values to arise. In a ritual, Mirei returns Dianamon returns to Sayo. Normally, Aiba should be subject to the same fate as Sayo for killing the Seven, but Mirei intervenes. She uses the Evidences of Sin to spawn what she calls the ultimate Digimon that shares the new values with the gathered Evidences: Monzaemon. Sayo resolves to fight, and Aiba and Sayo take down Monzaemon. Though Mirei performed the experiment to introduce something new into the world, Mirei instead finds her own eyes opening and ends up pleased with the results of her experiment. With Aiba and Sayo's journey together complete, Sayo and Dianamon return home. When Beelzemon puts up the request on the BBS for Keisuke Amasawa, Lilithmon comments that the situation is interesting and that she will "maybe" go take a look. She is later killed by Aiba, who kills all members of the group to free Dianamon. The Seven Deadly Digimon lived in the Dark Area, the group controlling it. The seven of them forged a pact of non aggression, as fighting against each other was considered pointless and would watch each other, to make sure none of them broke the pact by raising an army of Nightmare Soldiers. They each built a tower out of boredom, however one day, all seven towers were absorbed by darkness - leaving them to flee into the Dimensional Sea, however the damage was done and when finding themselves in the Next Order universe, all went into a deep slumber and were awaken due to the power of reincarnation. After the events of Piedmon and Myotismon turning on Takuto/Shiki due to a dark energy possessing them, Lucemon FM and Beelzemon confirm it was the same energy that had destroyed their Dark Area. This dark energy is later confirms itself to be the "Malevolent Fist", which then forces Piedmon and Myotismon to DNA Digivolve into BoltBoutamon, leading the Malevolent Fist to be responsible for its own birth. After the tamer defeats Boltboutamon - Beelzemon, Lucemon, Shoma Tsuzuki and Noir charge in, and Boltboutamon remembers the Deadly Digimon. Noir, Lucemon and Beelzemon attack BoltBoutamon, however he proves to be too powerful - to the shock of everyone. Accepting their deaths, everyone is shocked when BoltBoutamon leaves through a dark portal, wanting to have another "party" with them all again one day. The Malevolent Fist then clones the body it created and leaves, returning Piedmon and Myotismon to normal. Beelzemon is one of the Seven Deadly Digimon. Despite being one of the Seven Deadly Digimon, Beelzemon doesn't like being put in a group, and acts separately from the others. After Takuto or Shiki defeats Omegamon Alter-B, Beelzemon will challenge them to a fight when approached. After being defeated, he'll go to Floatia's Dimensional District, where he'll warn Takuto or Shiki about the other Seven Deadly Digimon. Belphemon Sleep Mode is one of the Seven Deadly Digimon. At some point, Belphemon starts to sleep in the Concealed Gorge. Cherubimon detects its power, but fears to be corrupted if they get too close, and asks Takuto or Shiki to defeat Blephemon. After being defeated, Belphemon goes to Floatia's Dimensional District and Jijimon wonders what it is planning to do. Barbamon, Creepymon and Leviamon are three members of the Seven Deadly Digimon and are found in the Celeb Blue Room in the Bony Resort. Having heard about Takuto/Shiki saving the world, they arrive specifically to find the tamer, wanting to recruit them into the group because joining the group is the exact same thing they've been doing... except backwards - though Leviamon is only concerned with literally eating the tamer. They also want to recruit the tamer, because despite calling themselves the "Seven Deadly Digimon", there are only three of them - meaning they don't act alongside the other members of the group. After being defeated, the three decide to join the City because according to them, whether the tamer joins the group, or the group joins them in the City, it's the exact same thing. The three join the Dimensional District, though Jijimon worries since Leviamon literally wants to eat the District. Lucemon is a member of the Seven Deadly Digimon and is found in the Frozen Divider in the Frost Cathedral and claims to have been watching Takuto/Shiki for their entire journey in the Digital World and asks if the tamer knows the difference between good and evil, and assumes the tamer would assume Lucemon is good because of his appearance as an angel, then warp digivolves into Lucemon Falldown Mode and states that he has transcended the concepts of both good and evil and fights the tamer so they can learn the difference between good and evil. After being defeated, Lucemon states that the tamer is good, but knows the tamer doubts him and promises to turn everything they believe in upside down the next time they meet. Lucemon is later found even further into the Frost Cathedral and states that yet again, he had been watching everything the tamer had done and was only reaffirmed that the tamer is a force of good and that they arrive to their conclusions through battle. Lucemon then decides that the winners of battles are good, and the losers are evil and then digivolves into the embodying of evil itself, Lucemon Satan Mode, and fights the tamer because Lucemon wants to shed the tag of being evil, so clearly winning against the tamer will mean Lucemon is now good, whilst losing means it will just add another sin to his history. After being defeated, Lucemon instead decides that being good is to mix a noble heart with wicked thoughts and to move forward even with clutching pain and anguish in your heart, then decides to continue watching over the tamer and asks to see their power of good in person again one day, joining the City in the Digital Dimension. Lilithmon is a member of the Seven Deadly Digimon and is found in the Logic Volcano and and was looking for Takuto/Shiki due to them saving the world but is disappointed in what she finds, with the tamer being a "scrawny runt", meaning they will be unable to "satisfy her" and that she will battle them to "pass the time". Lilthmon then gets angry due to the tamer not understanding her and demands a battle. After losing, Lilithmon is happy, stating it had been a long time she had had such an enjoyable battle, since she usually just fights the other Deadly Digimon in vulgar battles and decides to join the City because of her now "being interested" in the tamer, and that she can be "quite accommodating" and will "see them soon" and joins the Digital Dimension. Beelzemon attacks some Goblimon who are minions of another Digimon. ↑ V Jump, 2004 issue. ↑ Lucemon Shadowlord Mode's profile also names these "Crowns" (冠, Kanmuri? ), in a reference to the First Beast of Revelation.